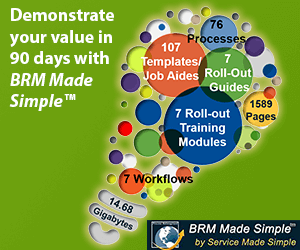 Get ready to celebrate World #BRMWeek. For the past few years, we’ve celebrated World #BRMDay with members and organizations around the globe. This year, we’re making it bigger and better: get ready to celebrate your and your BRM team’s milestones during World #BRMWeek. Here at BRM Institute, we recognize the hard work and successes of BRMs like you year-round—but do you? 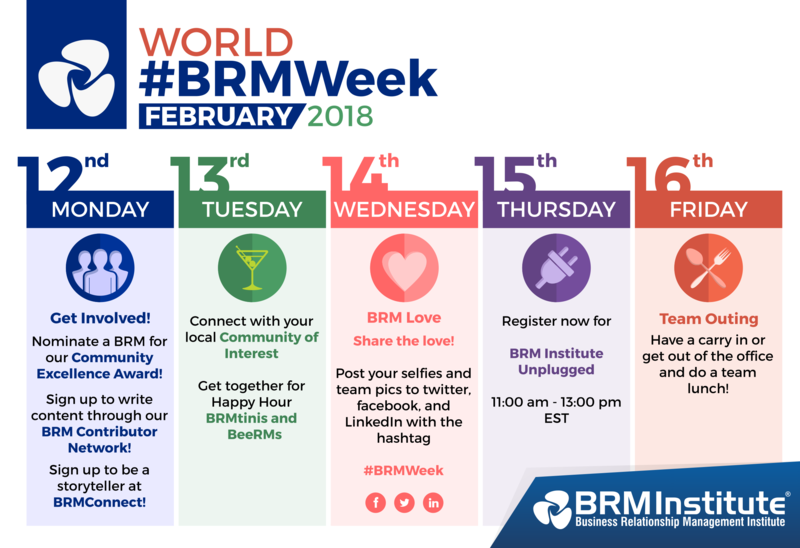 During the week of February 11-16, 2018, join us in honoring all of the work you do for your organization in a week-long celebration called World #BRMWeek! During this week, take the time to recognize your and your team’s tireless efforts to serve as a strategic interface between your business function and business partners, shape business strategy, and share ownership of business value and results. Why not send your BRM team a token of appreciation, or take them out to lunch? After all, you deserve it! As always, don’t forget to post selfies of you and your team on Twitter, Facebook, and LinkedIn, using the hashtag #BRMWeek. Let the world know this is your week to shine! Want to take part in the festivities worldwide? Take a look at the week of events we have planned for you and your team down below! Click on a COI to see when and where to connect! Contact Gary Hardy at [email protected] or comment on this page for an invite. Show your support by posting a picture of yourself doing BRM. Don’t be bashful! Post it to The Great Lakes Region CoI by clicking on Create a Blog Post. Show our Pacific Northwest spirit by sharing pics of yourself in your natural habitat! Add them to our Pacific Northwest Community of Interest page!